WiFi speakers have been a recurring topic of interest at CES, and this year’s show has not disappointed. Several tech companies, both large and small, have presented new products in this vertical. 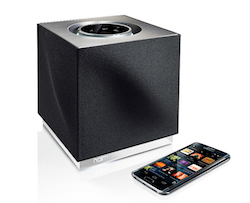 Multi-room wireless speakers are one of the subcategories that got a lot of attention. Philips introduced a range dubbed Izzy, which includes five detachable speakers that can function individually or be synced up for more comprehensive audio coverage. This is a direct challenge to Sonos, which has been the front-runner in the industry for some time. Raumfeld is also promoting its multi-room speakers in Las Vegas. Rather than focus on new devices, the company announced that it is adding support for Google Cast and SoundCloud playback. It still has a long way to go to catch up with Sonos’ long list of compatible services, but either finding a unique niche or building a more comprehensive suite is one way that a speaker system could stand out in the increasingly crowded field. But WiFi and Bluetooth isn’t just the purview of tech majors. Riva Audio and Naim are two other companies that are demoing their WiFi wares on the show floor. A focus on design or sound quality can make these small organizations cult hits with audiophiles. With a few more days to go, there could be more brands dropping news or product announcements in this category before the week is out.